When Starz announced in 2013 that it would be adapting Diana Gabaldon’s popular Outlander book series for television, I wrote an in which I voiced some of the problems in adapting the series for television—and in doing so, inadvertently ticked off some of the book’s fans. A year and a half later, I am still concerned about some of these things. That said, Ron Moore and his team have done an amazing job so far. The season began a little slow for my taste, but more than made up for it during the last few episodes. Moore has, so far, stuck pretty closely to Gabaldon’s story, with one notable exception: the decision to bring Frank, Claire’s husband from 1945, back into the story during the last episode, show how he’s been coping with the loss of his wife, and have Frank and Claire almost but not quite reunite at the stones. It was one of the most tense, dramatic scenes in the series so far, and it was awesome. The television adaptation also shows some of the most empowering, and frank, depictions of female sexuality that I’ve ever seen on television. (How can you leave a husband who goes down on you in the middle of a ruined castle?) Having seen Moore’s representation of this world, I have more faith that the show can weather the time jumps than I did a year and a half ago. I am talking, of course, about the spanking heard ‘round the world. And no, this isn’t 50 Shades of Grey here. The first half of the season ends with Claire being abducted by the evil Captain Jack Randall on her way to return to the stones and get back to her life in 1945, and Jamie dramatically (and handsomely) coming to her rescue. BOOM, end of episode, end of first half of season 1. It’s a pretty awesome note to go out on, and practically guarantees that viewers will want to come back for more. Readers of the book know that Jamie will rescue Claire. Problem is, Claire’s actions in disobeying Jamie have put the entire group in jeopardy, and Claire must be punished for it. Jamie whips Claire with his belt. Claire is angry and humiliated, though she ultimately forgives Jamie when he talks about how his father used to whip him as a child. She also extracts a promise from Jamie never to do that to her again. I recognize that the norms and mores of 18th century Scotland are a lot different than 21st century America. But I am approaching this book as a 21st century reader, and a 21st century woman…and frankly, the scene bothered me quite a bit when I read it. Claire is his wife, not a child…and furthermore, Jamie seems to enjoy it, admitting later that he was turned on afterwards. 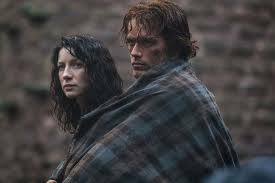 There is always a certain violence to Jamie and Claire’s sexual relationship, and at times this can get more than a little disturbing—I’m thinking of one particular scene, late in the book, when Jamie is traumatized and delirious from fever—so this isn’t unprecedented, or out of character for him. And afterwards, he never breaks the promise he makes to Claire never to beat her again. But we’re reading the story entirely from Claire’s perspective. Claire is stuck in a time that is not her own, trying to make the best of a bad situation. She married Jamie because she was forced to, but she unexpectedly developed real feelings for him. Claire is keeping so much of herself hidden, and she’s surrounded by people who don’t trust her. Jamie has been, through all of this, her only ally. Though she hasn’t been able to be honest with him about her situation, they’ve formed a deep friendship and trust in spite of everything. When Jamie whips her, it feels like a betrayal. Yes, you can make the argument that Claire never should have disobeyed him in the first place. But Claire is not a child, but a grown adult. And yes, again, I also recognize that applying 21st century values to an 18th century situation isn’t historically accurate. But when you write a book, you create your own reality. It might have been accepted, even common, for an 18th century man to beat his wife. But I’ve read plenty of historical romances set around the same time where the man would never dare so such a thing. There’s no right or wrong here; this one is just my opinion. It unsettled me, but not enough to stop reading the book. I ultimately forgave Jamie, but it took me a lot longer to do so than Claire. Even so, I’m not sure how I’m going to react to seeing it on screen.